My daughter found Paul through Google. He was a great Instuctor, calm and thorough with his teaching. My daughter felt confident and well prepared going into her driving test and passed first time. 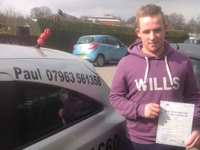 I had no hesitation in booking Paul for my son who had struggled with the theory test. Paul gave him support where he needed it most, and again felt so at ease going into the practical driving test that he also passed first time! An excellent teacher and I have no hesitation in recommending Paul. Paul is a great driving instructor. He was very calm and patient with me as well as taking things as a pace I was happy with. When I first started driving I wasn't very confident but Paul reassured me by making me look at driving and certain situations in a different way. I also had motorway lessons after my test, which I found a great help. I would recommend Paul to anyone, cannot thank him enough for getting me through my test. I first started my lessons with Paul in September and seven little months later I'd passed! Paul always made me feel so at ease when driving, he's the kindest person you could ever meet. Talking to him about things you struggled with was never an issue he'd always understand. Paul always made sure that I'd never leave a lesson where I was unsure about something he'd always cover it. Paul was always on time never late he's a very punctual professional man. To sum up I would highly recommend Paul to anyone he is an excellent driving instructor that will get you on the roads in no time. I started my lessons with Paul last October and I couldn't have asked for anyone better to teach me how to drive. He was always on time and always made me feel at ease whilst driving. He was very polite and friendly before and during my lessons and always made conversation. Paul made things very clear for me to understand and he always explained in detail what I was going to do. In summary I would recommend Paul to anyone as he is an excellent driving instructor and helped me a lot. I started to learn to drive with Paul in October 2014 and had managed to pass my driving test (first time) by August 2015. I found Paul to be very friendly, approachable and constructive in his feedback helping me to understand why I had made mistakes or what would be a better approach to a situation. I would thoroughly recommend Paul to anyone who is wanting to pass their test and be a good driver. The freedom and independence I now have through driving is all thanks to Paul's lessons and his wealth of knowledge. Wish I'd of done it sooner!! I found Paul to be a fantastic instructor. He was always calm, collected and ensured that I understood everything that was going on. I passed with only three minors and that was in largely down to Paul’s instruction which got rid of any bad habits I had before my test. He was friendly and helpful at all times and I couldn't have asked for a better instructor. Thanks again Paul! I want to say a massive Thank You to Paul Micklethwaite for Teaching me to drive and helping me to passing on my first attempt. Paul a Year ago just thinking about driving scared me but now you don’t realise how much freedom you have with having your own car and being able to get from A to B! I would recommend Paul to anybody just as Paul was recommended to me a year ago he is calm and talks you through things before and after every lesson which makes you feel more positive on the journey of learning to drive, Once again Thanks Paul! Thanks for getting me through my driving couldn't of asked for a better instructor. Look after your self cheers again. Just want to say thank you for helping to get Ryan through is driving test. Got your card and will recommend without doubt in the future. All the best Paul thank you. Driving certainly wasn't something that came naturally to me, and after over a year of lessons with two different instructors I wasn't making any improvement. So when I finished university, I decided to get in touch with Paul, and it was one of the best decisions I ever made. I made more progress in my first few lessons with Paul than I ever did with my other instructors, and soon I was looking forward to my lessons instead of dreading them. Paul is great because he didn't just tell me what I was doing wrong like my other instructors did, but he told me why I was making those mistakes and talked me through how to improve on those things that I just couldn't seem to get right. He'd also catch up with how I was feeling about driving before and after every lesson, so he could work on areas I felt I was struggling with and make me feel more comfortable in the car - something I appreciated as an infamously nervous driver. I completely credit Paul for me passing my test, and I'd recommend him to anyone who's looking for an instructor. Not only is he hilarious, but he's reliable and he'll help you pass quickly, and by the end I have no doubt in my mind that you'll be an excellent driver. I started learning to drive with Paul in February 2013. Having on average two hours a week, give or take the odd week, I passed my test on the first attempt on Friday the 13th September with 2 minor faults. Paul made every step of the way a joy and something to look forward to each week. His teaching style is very relaxed, he has plenty of patience and takes as much time as you need to ensure you fully understand everything he has to teach. You can really see how much he enjoys his job and it rubs off on you during your lessons. Lessons are very relaxed and casual and Paul makes every effort to chat and relax you. If there is ever a need to change the time or date of the lessons booked, a quick text or phone call is all that is needed and he is very understanding and has no problems rearranging your lesson as needed. I would thoroughly recommend Paul to anyone who is wanting to pass their test with confidence. Thanks! Paul just want to say a massive thank you for everything, not making me have more lessons than I need, been flexible with your lessons, and also just been a top instructor! Thanks alot Paul, I'm going to pass your number on to as many people as I can! Thank you again!! As soon as I started my lessons with Paul, I felt confident and safe under his instruction. He was patient and friendly through out all of my lessons and explained thoroughly what I was doing and why, so that I understood everything instead of just knowing how to drive. He made it so easy and natural that by my test I was confident and calm and passed first time. I'd recommend he to anyone, he is fantastic! Paul was recommended to me by my next door neighbour so i looked him up on the LDC website. The next week i was learning to drive with a very good driving instructor who was always patient and professional. I was always at ease whenever I drove with Paul and I always felt comfortable whilst driving under his instruction. I passed my test first time with Paul and now i'm driving safely and confidently on the roads on my own. I could highly recommend Paul for any new driver with no experience or an advanced learner looking to brush up their skills. Best instructor I could ever imagine! so friendly and chatty from the word go made me feel so much at ease! passed both theory and my test first time thank you paul for all your help and support, your a great person! will recommend to everyone!!! 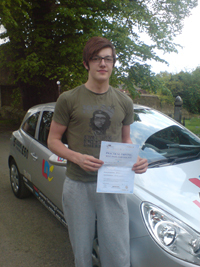 Just passed my extended driving test today with 3 minors, a great achievment within the 70 minutes i was on test. Paul gave me the confidence and helped me erase bas habits i had within 15 hours i highly recommend paul for any type of test as his knoledge and know how is second too none. Paul is a brilliant driving instructor, he is very patient and caring towards his pupils. I passed my test first time and wouldn't be where I am if it wasn't for Paul's support and advice to get me through the good and the bad. Big thank you to Paul and keep up the hard work. Thank you. "Paul had patience enough to teach me to drive....which is no mean feat, considering i had zero confidence, road sense or observational skills, coupled with a mortal terror of clutch control. Lessons with him were extremely good fun, not only did he manage to get me to retain the finer points of mirror, signal, manouver, he made the process of learning to drive an absolute blast - he's a teacher with passion, drive (har har har) and a fantastic sense of humour who clearly loves what he does, and is always willing to push you a little and challenge you, but at the same time provide a nurturing and involved learning experience. He has an immensely calming influence and for someone like me, who wants to master something the first time they try it, and gets very upset with themselves when they don't, he was a godsend. Paul is a brilliant instructor, an amazing teacher and thouroughly great chap. Now I've passed my test and no longer need lessons, I can honestly say I will miss him. Thank you Paul..... You're an absolute star, and I could not recommend you enough as a driving instructor!!!" From October to June I had lessons with Paul, each one I would really enjoy, he helped my progress in every lesson, he is very patient and understanding, and really easy to get along with - Will make converstation which helped calm my nerves. Always there if i was unsure on what to do & helped me increase my confidence, made sure that i was okay and that i had a full understanding of the lesson ahead. He is a friendly man, very kind and this lessons were fun which kept me interested in driving.I feel like i chose the best driving instructor and would recommended him to everyone, he helped me pass my test and made me feel confident - even when i had my bad days, he always recognises the good things that i had achieved which is also a bonus. Will miss my driving lessons with Paul. Paul was my driving instructor between the 29th March and the 26th May. During this time Paul taught me everything I needed to know the best way imaginable. He is very patient and understanding and explains everything in a easy to understand way. Paul was everything i'd hoped for in a driving instructor. I passed my test first time on the 26th May and would recommend Paul to anyone. Paul was my fifth driving instructor and since lessons with Paul my driving has really improved and i have now passed my test. He's a great instructor and I would recommend him to any of my friends or family. Paul was my driving instructor from the March 2nd to the 14th April. Throughout this time I had 30 hours of tuition and throughout this time he was on time to all of my lessons and was very friendly and was always helpful at all times even when I found things difficult. I passed my test first time first time with only 2 minors and couldn't have asked for a better instructor. I was recommended him by a friend and would recommend him to anybody else wanting to start driving. Top class driving instructor!!! Paul was my instructor from October 2010 to March 2011. Throughout the time I found Paul to be punctual, reliable, friendly and patient. I did not pass first time due to silly mistakes on my part, but Paul was nevertheless patient and his constant belief in me was unfaltering even when I began to doubt myself. I would recommend Paul to anyone thinking of taking driving lessons, in my opinion he is definitely one of the best. Thanks again Paul for all your hard work. I am writing this recommendation having passed my driving test first time just over a week ago. I was personally recommended to Paul by a friend and I have been extremely impressed by his professionalism, patience and commitment in assisting me in passing my driving test. He is able to clearly articulate the skills and knowledge required to be a successful driver. He has always been very prompt, polite and flexible during my lessons over the past 10 months. Paul certainly comes highly recommended and I will personally encourage any of my friends to contact Paul. Paul was my driving instructor from August to November 2010. During this time I had 31 lessons and found him to be totally reliable in terms of attendance, time keeping and tuition. His instructions and explanations were easy to understand and I found him very friendly yet professional. On November 28th 2010 I took my test and passed first time and know that this was due to Pauls excellent tuition. I have since recommended him to several of my frends. Ricky purchased a 30 hour course and passed first time. Throughout my driving lessons with my driving instructor, Paul I have really enjoyed being with him as he is understanding, patient and really good to drive with. Never loses his temper and is always making sure you are ok and understand everything. He is friendly, polite and makes you laugh at times when you just need to relax and take a breath. So you forget what you have done and feel happy to go again. Also he will go over things with you and make sure you understand everything and how to correct it. All in all I couldn't have asked for a better instructor. I have passed my test 1st time with 1 hour a week for 39 weeks. I would recommend him to anyone. Been brilliant, I've enjoyed every minute of it. Paul is great to learn from and very thorough in what your taught. I`d recommend him to anyone. The best choice I ever made was to change instructors. When I met Paul he completely changed the way I drove and improved my confidance massively. I am an incredibly nervous person and often panicked when I made a mistake. I recommended Paul to family and I will always be greatful to him for helping me get though it. I was shocked when I passed first time, but Pauls belief helped me massively. :) A* Driving instructor!! Paul is a great instructor, can out anybody as ease trust me. All my lessons have been fun with Paul, he is very reliable. Enjoyed my lessons with Paul and learn't alot and happy I passed my test. After passing my test I did my Pass Plus which saved me money on my car insurance. Thanks very much Paul, enjoyed your lessons and past in to time!! I passed with no minor marks.